The vascular system of the pancreas is complex and nontypical. Embryologically, anatomically, and surgically, the head of the pancreas, the common bile duct, and the duodenum form an inseparable unit. Their relations and blood supply make it impossible for the surgeon to remove completely the head of the pancreas without removing the duodenum and the distal part of the common bile duct or to leave a rim of pancreas along the medial border of the duodenum to preserve the duodenal blood supply. Operating room steps for evaluation of resectability of the pancreas are presented. There are several possible routes to exploration of the pancreas, which may be used individually or in combination, each with particular advantages and disadvantages. 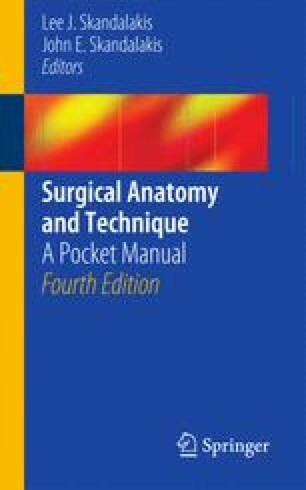 Step-by-step technique for the Puestow procedure, pancreatectomies, and pancreaticoduodenectomy (Whipple procedure) is provided. An enlarged and revised section on laparoscopic resection of the pancreas includes laparoscopic distal pancreatectomy, transduodenal-pancreatic biopsy, drainage of pancreatic pseudocyst, and repair of pancreatic trauma.